Find the Best Stuff on Listia, FASTER! 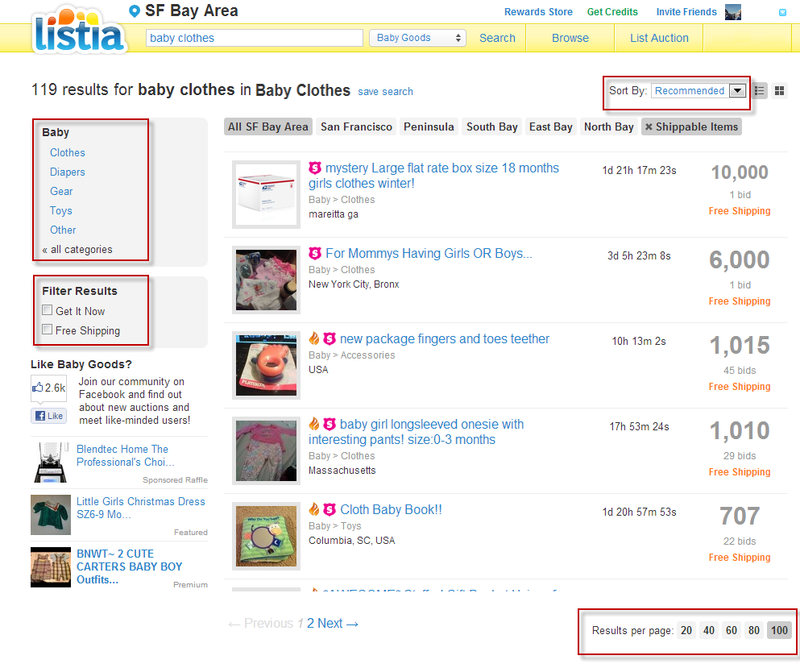 Today’s Listia Tip is about how to find the best stuff on Listia, faster! You probably already know how to do a search on the site, but did you know that you can also use the Categories to “filter” the search results so that you find what you’re looking for, faster? Let’s say you’re looking for clothes for your baby, so you did a search using the words “baby clothes” and the site found 235 auctions containing those two words. But you’re specifically looking for clothes only and not things like luggage that can hold baby clothes or dolls/toys with clothes on them. You can click on the Baby category (see screen shot below, left side) and the search results number goes down because it’s now showing you only the auctions that are listed in that specific category. If you want, you can refine it further by clicking on the subcategory called Clothes, and now you’ll only see the auctions that were listed in that specific subcategory. This is called “filtering” down your search results, and it’ll help you find, bid, and win the stuff that you’re most interested in, faster. And do you want the item right now, without waiting for the auction to end? You can just see the auctions with a GIN (Get It Now) option, by putting a check mark in that box (also on the left side of the screen). Same thing with Free Shipping…only see the auctions where the seller will ship it for free! There are lots of other things you can do with the Search feature to make it easy to find the best stuff for free, including having your search results emailed to you regularly. That way, you don’t have to keep searching manually. Sorting the auctions so that you can see which ends first is also possible. And setting the “Results per page” setting to something higher than the default is also a nice way to see things just the way you want. See the red boxes in the screen shot below for details. How do you use the Search feature? Have any other search tips to share? It sure would be nice to search by category, but right now its a mess. When are you going to put some more categories back? It is VERY difficult to browse thru the categories right now. Its no fun at all trying to find anything thru all the junk (recipes, diy, etc) that should be in categories themselves!! Hi, yes, they’re being worked on right now so expect to see them rolled out within a few weeks. Thanks for the input! Yeah please get rid of the recipes and diy! They’re such a waste of time! Especially for international people, it’s all we see while trying to search for actual items! Some even try to trick people actual items are going to get mailed to them! lol! I think that the recipes and diy is very useful for lots of people. I have to admit that I have bought a recipe, tried it and it was really good. Yes, Agree here on getting rid on DIY and recipes. In my opinion, They have cluttered up Listia by listing them and it seems that they are posting more and more DIY and recipes everyday. They need their own category, that way you know what you’re looking for and where it is located. Yes, I was foolishly tricked with a description of ‘what you see is what you get’ and it was a set of toys, so i bid. it was an email picture of toys that probably does not even belong to them. i did not bother is provide my email addy in case it was a spammer too. I hate the recipes and DIY. Often you may end up bidding on something that you THINK is a baby hat, but really it is just a pattern to MAKE the baby hat. If I wanted that, I would google it. Yeah, we require the sellers to state that it’s a pattern, if so. Sorry that happened to you. It is tricky to do such in a way that is hard to understand, or in the description only. Sometimes if you are on the phone, it takes forever to scroll down and view the description. I think the first thing it should say on the item description before anything should be: DIY!! I agree, the seller should state that it is a pattern, a diy or otherwise. Those certain things should have their own category, that way you know where they are and if that is something that people don’t want to look at then they don’t have to because they will be in their own category so people will know to avoid that category unless that is what they are looking for. I like the recipes and the diy etc. I think it would be a nice thing to have around listia. I do most of my stuff with Listia from my iPad using the Listia app. Things like…listing my items and hunting the auctions for that “always attainable” great deal! I’m completely addicted to Listia!!!! My only issue with using the Listia app is this, there is no way to check my messages from the app! Is there a way to be able to check my messages from people from the “Listia App” that I don’t know about? If there is not a way to do that (check messages) currently…can you please fix that? Yes, we plan on adding the ability to check your Private Messages (PMs) via the app too. Thanks! I too use my Listia App that way I NEVER miss an auction while on the go and would love to have the same options as the users on computer. I know that it may be hard getting all of it on there. Also I like the idea of being able to see ALL ITEMS a seller has with just one click instead of 3-5 clicks and page loadings!! I was looking through jewelry yesterday, it was very messy. then i filtered it for earrings to see where my 2 were listed, couldn’t find them. You could make filters for silver/gold , new/used. would look neater [no matter what size actual picture], on the search pgs. they same size. lot of work, i’ve had websites, i understand. you have a team to plug away at it. it’s still a Very cool site. Like the idea ; how to open the items you like without leaving the page. that’s such a great idea ! esp. my pc moves to slow. if it was faster , get twice the work done in half the time . thanx , Listia .! Recipes should be banned completely because most of them are just taken from other sites, like Pinterest. When I see recipes on Listia, I look them up on Pinterest, find the original recipe, post that link in the comments section on the auction. Normally nothing is done about and the only action taken is that the Seller blocks me and/or my comment. And do you want ORIGINAL recipes blocked also??? – If searching for shoes: I go to Clothing, Shoes & Accessories; Then to Women; Then to Shoes. Then in the search bar I type 8. This pulls up all shoes that are size 8. This does include boys/girls and women/men and it includes sizes 8 1/2… but filters everything else. A question/concern/idea is the bulk of email received by Listia. It’s like you get two e-mails for every one e-mail left for you on-site. And keeping track of the emails is almost a full time job. My suggestion is if you send notice that someone has written to you, then don’t also send what they have written to you in a separate email. And if someone responds to an email, it would be nice if it were all kept together so you don’t have each response back-n-forth resulting in a totally new and separate message. If you go to the auction site page, all emails are listed as one, in the order they were written like a conversation. That format would be so beneficial in the mailbox as well. I like your search tip about finding the shoe size! I was wondering if you set a auction and will ship the item by email liek if it was a code how would you get their email? Obviously after you win the auction you have to provide your email address to the lister. If you don’t want tp pay shipping make sure to search for free shipping. I got caught on paying shipping without realizing it. Its pretty bad that listia won’t do anything for international users…. Hope you could do something on this matter.. I would like it if I could save my search settings. Such as the searches under the “Browse Tab” and the “Sort By Tab”. You are either wasting a lot of your server’s cycles AND my bandwidth, OR your are wasting a lot of my computer’s cpu cycles as you count down seconds to the end of auction on an item more than 15 minutes from end of auction. JUST COUNT DOWN MINUTES until really close to end of auction. Geez! Just because you can do something is no reason to do it! I am having a hard time keeping up with my messages now that I have over 600 or more back and forths with other listians. Can you make it to where the same users messages are all together no matter what day they sent them when you wan to go back and check something that was discussed with that person. It is all very hard to find and confusing at times. Thanks just a thought. I adore Listia and take it with me on my Samsung Galazy SIII and stay hooked up during the day on my computer at home. I do not think I like the new way that the page will be set up either, most of the times change is great and other times the older ways of doing things are more simpiler to those like “MY MOM”, who I will have to reteach everything to AGAIN!! lol. Good luck and thanks for making updates and letting us voice an opinion on it as well. I couldn’t find a contact listia option so I’m doing this, I’m having 2 issues one being I did a trial offer for e fax and did not get my credits, I have a subscription to them but no credits, my other issue is that I won an auction but it has yet to tell me I won and it’s holding all the credits I bid even though I got it for far less so now I have no credits to work with AND I cannot send my verified shipping information because neither me or the seller has gotten anything yet. How do I fix these problems? I love listia to death but little by little I’m having more problems. Would be nice to search items by their get it now price. What a pain that is without a feature to do it.